Shave or a haircut, pick which? The Weather Channel recently named Washington as the sixth hottest city in the United States, with an average of 37 days of temperatures above 90 degrees every year. I’ve seen plenty of dogs with a “summer shave,” and I always thought it looked silly, but that owners did it to help their dogs stay cool and decrease the amount of shedding in the house. But during a recent pet first aid class I took through Arlington Public School’s Adult Education program, I learned shaving your dog can actually be dangerous. 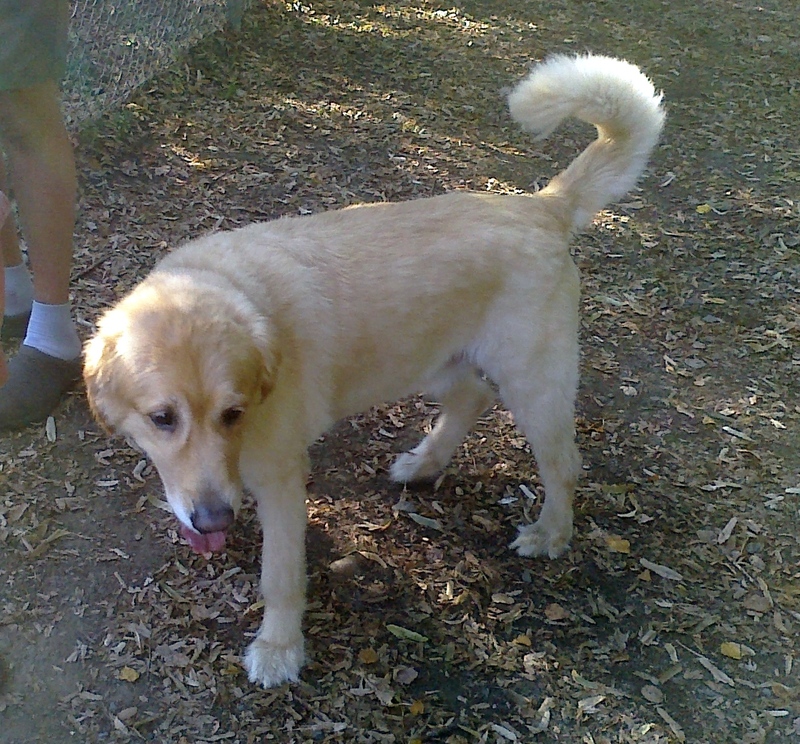 This Golden Retriever at the Shirlington Dog Park's cut left enough hair to protect his skin. I talked to professional pet groomer Cassandra Reed, who recently began offering her grooming services at Dogma Bakery’s Shirlington location. She said that when owners ask her to shave their dogs, she explains why it’s not a good idea. The topmost layer of dogs’ coats can also act as an insulator, keeping heat or cold from penetrating to their skin. Now with some breeds that don’t have a coat to begin with, such as the Chinese Crested, owners don’t have many choices. They have to protect their dogs’ sensitive exposed skin with clothing, or sunscreen, or by keeping them out of the sun altogether. Reed said that the majority of owners who want to keep their dogs comfortable in the summer do have grooming options, however. During the de-shedding process, Reed uses a special shampoo as well as four different grooming tools to remove loose, excess hair. 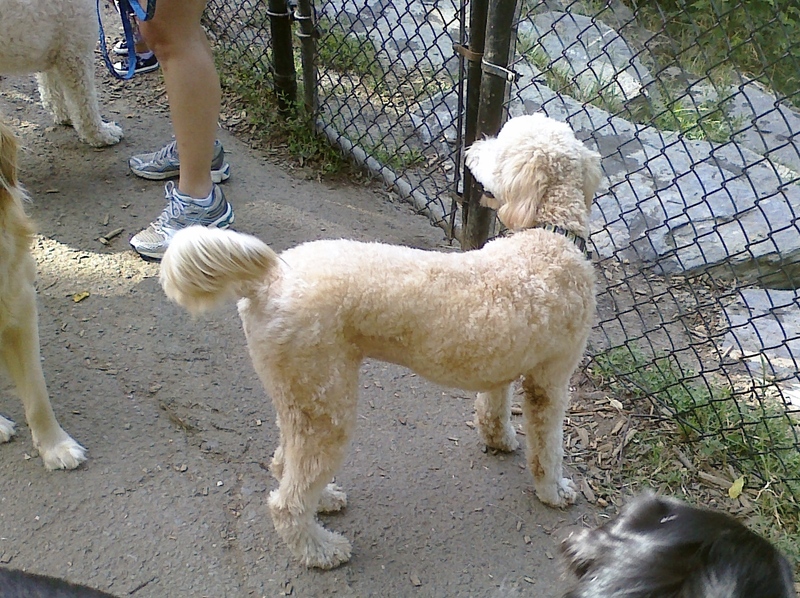 This Goldendoodle has its coat trimmed to a safe length. A haircut is another option, as long as enough coat is left to protect the dog’s skin. Special clipper blades can be used to to cut the hair to specific lengths. For example, a “retriever cut” is where a dog’s hair is cut to a 1 inch length all over the body. We’re all suffering in this oppressive Washington, D.C. summer heat. There are ways you can safely help your dog stay cooler, but make sure to consult with both your veterinarian and your groomer before making any changes to your dog’s coat. Appointments with Reed can be made through Dogma at 571-422-0370.